I sold this bench over the internet to clients in New York. They did a google search for Shaker Benches, found my site, and found my benches. This is the most popular piece that I have in my portfolio and I have sold several of them. The wood is curly cherry and even the back of the bench exhibits a fine piece of figured wood. I included sapwood in the project as highlights. I like the use of sapwood in a project. I use a single board to run continuous grain across the face of all the drawers. You can see how nice the look and effect of this conscious decision is in the close-ups of the drawers. Also note that I chose sapwood to highlight this effect as well. I used black walnut plugs but sometimes I use maple to contrast the cherry. I personally favor the black walnut. The finish is M.L. 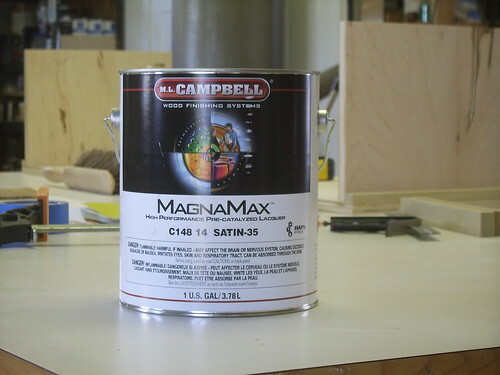 Campbell’s MagnaMax Satin pre-cat lacquer. The drawers have dovetails that are locked together with a pin driven into the top and bottom (I still use glue.) 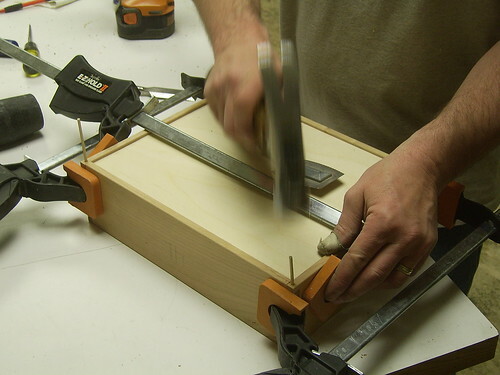 They could be assembled without glue and the dowel pins would keep them locked together. It also adds a visual design element. I know that I am not the only person that has thought of this as it is logical, but I have not seen anybody else do it. I recommend that others try it. I find it funny that this bench is the least of what I can do artistically, but it is the most popular of my work. I am quite proud of this piece though especially because it is my design. For those that are not aware, I made a video discussing the thought process and design considerations for this Shaker Inspired Bench. Nice job Todd…I told you before, shaker is not my favorite style but I really love this bench and I can understand why it is a popular seller. It is definitely a geat design. 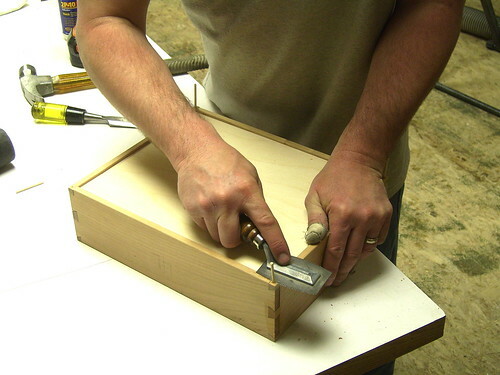 I’ve thought about pinning dovetails but I’ve never done it. Beautiful Todd, simply beautiful. You are an excellent craftsman, and maticulus in your work and in your designs. I really like Shaker furniture, and you made all the Shaker lovers proud. Todd: a great looking bench. I’m glad that others with money like it also. Karson – Yes, it is important that people with money like it. Especially if they are willing to spend it. Nice bench Todd looks like a design that’s working well for you. is this what we will make in the week long class you have next summer? Great bench congrats on the sale. Todd, I find that simple lines and fine craftsmanship has a lot of appeal. This bench demonstrates that in spades. great looking bench…..excellent work…as always…. whats something like this sell for? Mike – The 4’ bench with 3 drawers sells for $1150 and the 5’ bench with 4 drawers sells for $1250. Shipping is on top of that. SoCal – I think you are right. It is the thought process and design principles I was trying to get across because they are applicable to many other projects. This is a little talked about or shared subject.